For the French Prime Minister Charles Louis de Saulces de Freycinet (1828–1923, see Charles de Freycinet. For the national park in Tasmania named after Louis de Freycinet, see Freycinet National Park. He was born at Montélimar, Drôme. Louis-Claude de Saulces de Freycinet was his full name (many calling him Louis de Freycinet). He had three brothers, Louis-Henri de Saulces de Freycinet, André-Charles de Saulces de Freycinet and the youngest, Frédéric-Casimir de Saulces de Freycinet (father of Charles de Freycinet). Louis-Claude was the second oldest. In 1793 he entered the French navy. 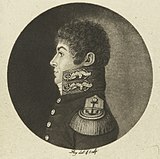 After taking part in several engagements against the British, he joined in 1800, along with his brother (Louis-Henri de Freycinet (1777–1840), who afterwards rose to the rank of admiral), an expedition to explore the south and south-west coasts of Australia. It set out under Nicolas Baudin in the ships Naturaliste and Géographe. Because Matthew Flinders was being held captive by the French on Mauritius, many of his discoveries were revisited and unintendedly claimed by François Péron, and new names were given by this expedition; in 1824 it was remedied in the second edition of Voyage découvertes aux terres australes. In the end, Baudin (who died in 1803) and Freycinet managed to have their map of the Australian coastline published in 1811, three years before Flinders published his. An inlet on the coast of Western Australia is called Freycinet Estuary. Cape Freycinet between Cape Leeuwin and Cape Naturaliste and the Freycinet Peninsula with Freycinet National Park in Tasmania also bear the explorer's name. In 1805, he returned to Paris, and was entrusted by the government with the work of preparing the maps and plans of the expedition. He also completed the narrative, and the whole work appeared under the title of Voyage de découvertes aux terres australes (Paris, 1807–1816). In 1817, he commanded the Uranie, in which the marine hydrologist Louis Isidore Duperrey, the artist Jacques Arago, his junior draughtsman Adrien Taunay the Younger, and others, with a guard of seventeen officers, sailed to Rio de Janeiro, to take a series of pendulum measurements as well as a larger scheme for obtaining observations, not only in geography and ethnology, but in astronomy, terrestrial magnetism, and meteorology, and for the collection of specimens in natural history. Freycinet also managed to sneak his wife Rose de Freycinet aboard. For three years, Freycinet cruised about the Pacific, visiting Australia, the Mariana Islands, Hawaiian Islands, and other Pacific islands, South America, and other places, and, notwithstanding the loss of the Uranie on the Falkland Islands during the return voyage, returned to France with fine collections in all departments of natural history, and with voluminous notes and drawings of the countries visited. The results of this voyage were published under Freycinet's supervision, with the title of Voyage autour du monde fait par ordre du Roi sur les corvettes de S. M. l'Uranie et la Physicienne, pendant les années 1817, 1818, 1819 et 1820, in 13 quarto volumes and 4 folio volumes of plates and maps. Freycinet was admitted into the French Academy of Sciences in 1825, and was one of the founders of the Paris Geographical Society. He died at the family's château de Freycinet near Saulce-sur-Rhône, Drôme. Vol. 1 Part 1: Book I France to Brazil. pub.1827. Vol. 1 Part 2: Book II Brazil to Timor. pub.1828. Vol. 2 Part 1: Book III Timor to the Marianas. pub.1829. Vol. 2 Part 2: Book IV Guam to Hawaii; Book V Hawaii to Port Jackson 1819. pub.1829. Vol. 2 Part 3: Book V Hawaii to Port Jackson; Book VI Port Jackson to France 1820. pub.1839. Navigation and Hydrography, Part 1. pub.1826. Navigation and Hydrography, Part 2. pub.1826. This article incorporates text from a publication now in the public domain: Chisholm, Hugh, ed. (1911). "Freycinet, Louis Claude Desaulses de" . Encyclopædia Britannica (11th ed.). Cambridge University Press. ^ Fornasiero, F. J.; Peter Monteath; John West-Sooby (2004). Encountering Terra Australis: the Australian voyages of Nicolas Baudin and Matthew Flinders. Wakefield Press. pp. 296ff. ISBN 978-1-86254-625-7. Retrieved 12 January 2011. ^ "The French Connection". International League of Antiquarian Booksellers. Retrieved 12 January 2011. ^ Sayers, Stuart (28 April 1962). "A French Wife's Voyage Around the World in Defiance of Orders". The Age. Retrieved 12 January 2011. Frank Horner, The French Reconnaissance: Baudin in Australia 1801—1803, Melbourne University Press, Melbourne, 1987 ISBN 0-522-84339-5. This page was last edited on 22 April 2019, at 03:03 (UTC).